The term “Natural Perfume” was relatively obscure more than five years ago. Many people, myself included, say we have been natural perfumers for years. But really, we were mostly amateurs, happily mixing simple blends, often cribbed from aromatherapy books, with our own preferences dropped in. Then there was a change in consciousness, and many decided that they really wanted to learn how to blend, and they wanted to define themselves as separate from mainstream perfumery, the stuff of department store choking clouds and allergic reactions. So, the term Natural Perfumery, like a synchronistic “click” in many scent-lovers heads, became the way in which we define what we do. In the 1800’s, before the discovery of synthetics that would change perfumery forever, natural perfumery did exist; it just wasn’t called that. The perfumers were just perfumers. The 20th Century saw the growth of Mainstream Perfumery and the increasing use of synthetic chemicals replacing the natural aromatics. Now, in the 21st Century, Natural Perfumery is the logical next step along the fragrant path for many aromatherapists. It is the road back through history that we are now finding, and it is wonderful. Aromatherapists are already used to blending several essential oils to evoke a mood, or bring about a desired physical change, and so this new trend, the natural progression of blending perfumes came into being. Aromatherapists, and others, suffering from chemical overloads, allergies and sensitivity to these synthetics, and perhaps just a gut reaction to the harsh and fake smells of these synthetics, moved towards a return to the perfumery of old, Natural Perfumery. Natural Perfumery existed for centuries before aromatherapy was conceived by Gattefosse in the early part of the 20th Century, and now many modern aromatherapists discovering that they want to refine their art and create “real” perfumes, sometimes, but not always, with a healing goal in mind. They are delving into the world of sensual pleasure and grand experimentation. One roadblock: very few of them have training as a perfumer, a requisite for understanding the complexities of blending the raw materials. One way past that roadblock? Classes, peer groups, and home study. Some aromatherapy books contain some basic, rather primitive, perfume blending tips. Usually using no more than five or six essential oils, these simple perfumes smelled nice, and performed their aromachology job, but didn’t approach “real” perfumery. Chrissie Wildwood’s seminal Create Your Own Aromatherapy Perfumes: Enchanting Blends for Body and Home (Piatkus Press, 1995) is now a collector’s item, selling for ten times its original price on Internet sites. This is due perhaps because of the recognition that she was the first aromatherapist to publish a comprehensive, industry-based book on blending from an aromatherapists’ palette. Still, she limited the choices to essential oils, only. Visit Chrissie’s website: http://chrissie-wildwood.com (As of 2015 this link is now non-functioning. See the note in right sidebar regarding this this paragraph. A few years later, in 2001, Mandy Aftel’s Essence and Alchemy: A Book of Perfume (North Point Press) became a bestseller and bolstered many in their aspirations to become “real” perfumers, due to the educational and coaxing nature of the writing. Aftel deftly led the reader through history, dabbling with exotic aromatics, revealing some secrets of beginning perfumery studies. There was no other book that addressed the beginner; no other book carried them along on a rapturous journey into the world of Natural Perfumery like Essence and Alchemy. Many of the aromatherapists who read Essence decided to explore the new aromatic world she opened up to them. Aromatherapy eschews the use of aromatic concretes, absolutes, resins and waxes. Aromatherapy is all about essential oils, and only essential oils. That is changing, as the recognition of the fact that if perfume is only to be dabbed on a small area of the skin, not rubbed in a large area, as in a massage, then there is a place for a well-conceived, well-designed perfume that contains absolutes, concretes and other “non-AT” raw materials. Another big boost to Natural Perfumery has been the Internet. There, a novice perfumer in Wisconsin, or Japan, or England can sit at a computer and obtain rare and wonderful essences from every corner of the globe. It seems the time is right, the opportunities are right, and social and spiritual consciousness are aligned to reinvent an old art in a new light. They can sign up for online study courses, and interact with other natural perfumers online. For this article, the focus will be on the production of liquid or solid perfumes, those fragrant delights that can be sprayed or dabbed or massaged into the skin. The liquid may be undenatured alcohol, or carrier oil, such as almond, jojoba, and others. The solid perfumes, carried in a small “compact”, are typically solidified with beeswax. It’s a whole new world opening up for aromatherapists, with a new language, new raw materials, and new skills to be learned. In France, and a few other areas of the world, notably India and the Middle East, there are still perfumers who make fragrances “in the old way”, rejecting the synthetic chemicals so prevalent in mainstream perfumery. In history, as now, the natural perfumer would extract the fragrant molecules by infusion, tincturing, enfleurage, or distillation. To make an infusion start by placing the fragrant material in oil and either heating the oil or placing the container in the sun, until the oil takes on the fragrance of the source. Tincturing required an alcohol base. The alcohol could be wine, or something stronger, like brandy or vodka. Again, the materials were placed in the alcohol until the liquid became fragrant. Enfleurage is a method of scent extraction perfected by the French. Trays of animal fat were the receiving media for delicate flowers like jasmine, gardenia and tuberose. 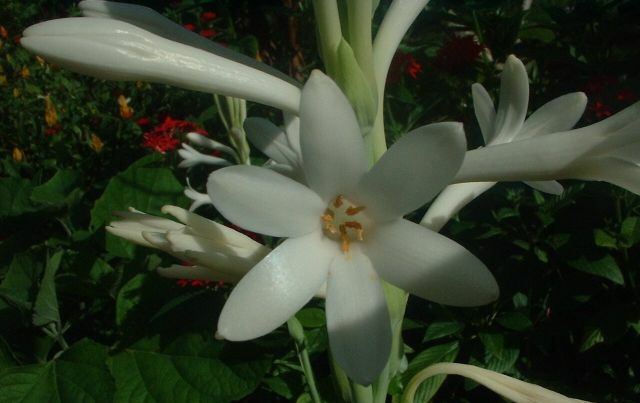 Usually, the flowers had to be replaced numerous times before the fat became saturated with the scent. Then, the fat was “washed” with an alcohol to separate the scent from the fat. Distillation, the art of placing the plant material over steam, and separating the “oil” of the plant from the water constituents, was typically done on a large, industrial scale, and, on a smaller scale, some home distillation took place. Mainstream perfumery — we all know what that’s about, attraction, seduction, empowerment and adornment. Natural Perfumery takes a different approach. Sometimes. Yes, it can be about “aspiration” — to feel better, sexier, prettier, younger, and more elevated psychologically. But the really beautiful element at the core, the heart, of Natural Perfumery is that the perfumer, if they are very sensitive and spiritual, will work with the client to create a scent that addresses the spirit, body and mind. This is only possible, of course, when the perfumer works on a one-to-one basis. Most perfumers start out with themselves as a client in the training and evolutionary process necessary to get to know the ingredients. The Natural Perfumer can still aspire to heal the end consumer that is unknown, that is, not a personal client, by composing a perfume that contains a theme, a focus, and a real goal. Not to say the Natural Perfumer who does not come from an aromatherapy background cannot heal and delight the client. The very act of identifying oneself as a Natural Perfumer indicates the person has turned away from mainstream perfumery, the synthetic chemicals and harshness, and to the true essences. They are on a path of enlightenment of spirit, psyche and body and soul. They come from varied backgrounds: soaper, esthetician, nature-lover, and lifelong perfume addict. They have a finely attuned nose that can discriminate between true and synthetic essences. They want to create a fragrance of beauty, one that inspires, seduces, delights and yes, sometimes, on a basic level, heals the client. Thus, many different people, from many different backgrounds gather under the soft, wafting breezes that carry the ribbons of scent, designed the Natural Perfumery way, to a new, eager clientele. And thus the new discipline and art of aromatherapy marries with the ancient discipline and art of perfumery to fashion an evolved perfumer, one who is hopeful to bring a fresh, beautiful, non-toxic scent to life. The modern mainstream perfumer is a component of an international fragrance industry. There are approximately 400 perfumers employed. Most are male. They have a college degree in science, and have completed a rigorous course in perfumery, training for years as “noses” under industry guidelines. Their education is long, arduous, and very demanding. Some work in the perfume industry, others in the “fragrancing” industry, creating scents for dish soap, laundry detergent and similar products. The Natural Perfumer, if the Yahoo group Natural Perfumery with 500+ members is any indication, is mostly female, without formal training. Instead, the Natural Perfumer looks to some aromatherapy books, Mandy Aftel’s Essence and Alchemy, and the sharing of knowledge on the yahoo group as the basics of learning how to blend. They work at creating perfumes; with some branching out to body care products such as body butters and lotions, candles and associated fragrant creations. The group has been in existence since June 14, 2002, the “early days” of Natural Perfumery, as defined for this article. Interest in the subject grew greatly after Aftel’s book was published in 2001, and “dryout”, top, middle and base notes, tincturing and blending descriptions piqued interest in the art. The history of the perfumes, the romance of the bottles, their liquid contents a source of pleasure and intrigue, helped fuel the Modern Natural Perfumer in going forward to refine their craft. Some teachers began to advertise their courses in Natural Perfumery, and more and more, the study of the art and the craft of formulating blends grew. It is an exacting, demanding world. Exact measurements of weights and volumes must be kept. Notes must be meticulous. Disappointment is high, due to inharmonious blends that may be left to sit for months, to see if they improve, or discarded. Costs are high, much higher than in aromatherapy; some absolutes and attars make rose otto’s price seem paltry in comparison. There is the rigorous demand that perfumers must spend part of every day just sniffing and studying the raw ingredients, constantly testing themselves. In some parts of the world, undenatured alcohol is very hard, if not impossible to obtain, due to government rules. A perfumer restricted in that way may have to consider only making oil-based perfumes, which results in a much different product. Not a bad product, just different, as alcohol allows many ingredients to take on a much more ethereal, diffusive nature. In the Yahoo group, members share tips and offer guidelines on all aspects of Natural Perfumery. Some members are generous with their hard-earned knowledge and offer formulae on how to blend a lilac accord, an amber accord, or how to properly work with a difficult substance, like guiacwood. Much of the information shared there cannot be easily found, if at all, in books. There is a lot of trial and error for the self-trained Natural Perfumer, and this community is probably the only one of its sort in the world for them. Here no question is insignificant. The archives of the group hold Files bursting with knowledge on hydrosols, INCI names, FDA regulations, IFRA guidelines, online sources of classic perfumery books, and, of course, blending tips. A separate section contains links to suppliers, sources of everything from bottles and pipettes to rare and beautiful attars and absolutes. Safety is as big an issue in Natural Perfumery as it is in aromatherapy, and the latest government guidelines, or author’s findings on the subject can be found in the Files or Links section. The list of schools teaching the subject is slowly growing, and it is too early to evaluate the quality of breadth and depth of that learning resource. Some Natural Perfumers travel to France, Grasse, in particular, to learn from the mainstream perfumers, and just leave out the synthetics, taking in the information and hands-on experience with the natural ingredients back to their workshops. This hybrid learning experience is rare, and of the 500 members on the group, perhaps less than a dozen have been able to study in Grasse. The rest are self-taught. Discussion of subjects that impact the Natural Perfumer can be far ranging. Many have stopped using sandalwood, rosewood, spikenard and several other endangered raw materials. The recognition that perfume formulae have to be in compliance with EU and IFRA standards to be sold in Europe is changing the way they conceive and formulate a blend. Many did not realize that use of certain oils, from rose to the citruses, can push a blend into “unsafe” territory regarding either chemical load on the body, or government regulations that oversee such things. The group exchange can save the perfumer lots of time, money and effort via this information sharing. Creating in a vacuum, such safety and regulatory constraints might not be known; in the group, late-breaking information is immediately shared, and the knowledge base grows. One of the most-referenced manuals on safety is Martin Watt’s Plant Aromatics. The sole distributor in the US is http://av-at.com, and in Britain http://aromamedical.org. For government regulations and industry guidelines, http://ifraorg.org and http://www.noharm.org/details.cfm?ID=743&type=document Link broken. Lush, Redolent, Sultry, Fresh, Frivolous — we find all of this and more in the Flowers, Woods, Resins, Leaves, Roots, Bulbs and Rhizomes, Seeds, Fruits, Barks, Beeswax, Seaweed, Seashells, Soil and other luscious lovely aromatics. Now aromatherapists can expand their repertoire to include the concrete and absolute of rose, the absolute of petitgrain and patchouli, the concrete of ylang ylang, the yummy absolute of chocolate. Additionally, the gorgeous base note of beeswax absolute is now available to help “fix” the scent, to make it last longer on the skin. High, middle and base notes are just limited to music anymore, they are the framework that the Natural Perfumer uses to build a fragrance, and part of the new vocabulary and discipline. Typically, a perfumer will begin a blend after defining the theme, or classification, such as Oriental, and choose aromatics that will accomplish that goal. The major “types” of perfume are: Floral, Woody, Green, Foody, Oriental, Chypre, Fougere, Marine, Citrus, Amber and others. The perfumer’s palette can include upwards of 300 natural raw ingredients. Many modern Natural Perfumers are taking it upon themselves to create their own extracts of raw materials. They do this by infusing (in oil) or tincturing (in high-proof alcohol) beehive scrapings, cucumbers, fruits and other materials not typically processed for perfumery. Cucumbers and fruits, for example, do not lend themselves to distillation or solvent extraction. The Natural Perfumers love the results of these experiments and are creating very personalized perfumes with them. What aromatherapist ever thought of using seaweed or burnt-smelling seashells for a scent? Yet seaweed absolute and the essential oil known as choya nakh fulfill this scent palette. Often the strong scents have to be diluted before use, as much as 90%, leaving only 10% of the original essence in the alcohol or oil. Some rare ones like kewda absolute, reveals itself at 1% dilution. It’s all a learning curve, and that curve is deliciously fragrant. Animal-based fixatives such as ambergris, civet, and musk are now outlawed or banned by international agreements, and are no longer readily available for perfumery. Some still use these products, despite ethical and humane reasons to the contrary. The best approach for Natural Perfumers may be full disclosure on their websites and products regarding whether or not their items are "cruelty free". That way the customer may make an informed decision about their purchase." In the world of synthetic perfumery, they have chemicals that “fix” the scent, that is, allow it to last longer on the skin. Many synthetic perfumes do have some natural essences in them, and some, in fact, do contain the animal products. That is why “full disclosure” is very important for the Natural perfumer. So, by not using the animal product or synthetic fixatives, the Natural Perfumer has to get creative to formulate perfumes that will last, since the nature of the essence is usually to vaporize quickly. That’s why they’re called volatile oils; they diffuse and evaporate quickly in the presence of heat and oxygen. How exciting — to break out of the confines of low-diluent blends, one-note blends, into the world of multi-layered, complex formulas. How exciting to have a whole new world of fragrant possibilities open to aromatherapists. And how wonderful that we are using natural ingredients, trying to reintroduce and reinvent Natural Perfumery for our world, so that we might escape from the harsh synthetic fragrances that counteract aromatherapy. Where is Natural Perfumery Going From Here? It is a wondrous and unruly discipline. It is being defined and redefined constantly. Some insist on only organic ingredients. Others have taken a strong stance against using endangered species. All reject denatured alcohols and synthetics. There is a striving to find a marketing niche, and in the meantime most sales are done locally, and on the Internet, with few being sold in department stores and other outlets for perfumes, like boutiques. There is no formal or informal organization or guild for Natural Perfumers. Given that it is in its infancy, that is to be expected. Many interact, sometimes on a daily basis with others in the field, via the Internet, telephone, or, if they’re lucky in person. It truly is a brand-new world out there for Natural Perfumers. Seeing the passion and love that the Natural Perfumer brings to the field, it can only be assumed that this field will grow and mature. Natural Perfumery will become what it becomes, as simplistic as that statement is. Check back in five, 10 or 50 years to see how the ingredients blended now, at the beginning of this century, evolve and mature, like a fine perfume, to reveal its hidden beauty and strengths, in the future. Copyright © 2005 Anya McCoy. Reprinted with permission. All rights reserved. Note: these are all old links and are not guaranteed. As of January 2015 definitely bad ones have been marked. I've noticed from my Webpage stats that I'm receiving visitors from Agora due to a link in your article on Natural Perfumery. days, I would never have used absolutes for aromatherapy. When the book was first written at least 12 years ago, CO2 extracts were rarely available. So I made a point of saying in the introduction to the book that for perfumery purposes, we must concede that the use of absolutes are useful in creating beautiful blends. So, a number of recipes in the book do contain the more easily available absolutes such as jasmine, carnation, oak moss, rose and even orange flower absolute. or aromatics. Neither would I use endangered wild harvested aromatics such as sandalwood and Atlas cedar in my recipes. Oak moss is an eco issue too. As you also know, I've been wanting to revise and update the natural perfumery book for several years, but have been unable to find a publisher. Even though the book was very popular and continues to receive excellent reviews whenever anyone stumbles upon it, every publisher my agent has approached with a view to republishing a revised edition of the book have turned down the project. It is always concluded that perfumery is an exorbitantly expensive hobby, especially if absolutes and/or CO2 extracts are used. Moreover, it's too specialist a subject for most publishers to handle. The other problem is that although I've acquired reversion of rights to the title, publishers are always wary of taking on books that other publishers have decided to discontinue. This is an annoying fact of life in the world of publishing, which few non published authors are able to appreciate. It all looks so simple from the outside! I've also discovered that a few other authors who shall remain nameless here, have lifted information from my book, almost word-for-word in some instances, and yet have not had the courtesy to list Create Your Own Perfumes in their bibliographies. I can't cope with the stress of attempting to sue for plagiarism. So, I hope you will correct the error in your summing up of my book. I've been too modest up to now to point out that the reason my book is still sought after is because it is a well-written and highly informative little book, as people keep telling me. Such individuals don't have to write and tell me so. You make it appear in your mini review that the only reason the book is sought after (i.e. the exorbitant prices on Amazon) is because it was the first of its kind. In truth, it's also a quality book with more than just novelty value. Please correct this on the AGORA site and anywhere else you may have written the same erroneous assumption. Most of all it would help if you'd said why I no longer advocate the use of absolutes, sandalwood, Atlas cedar et al. Although I thank you for including a link to my eco website [no longer there] in your article on Natural Perfumery.